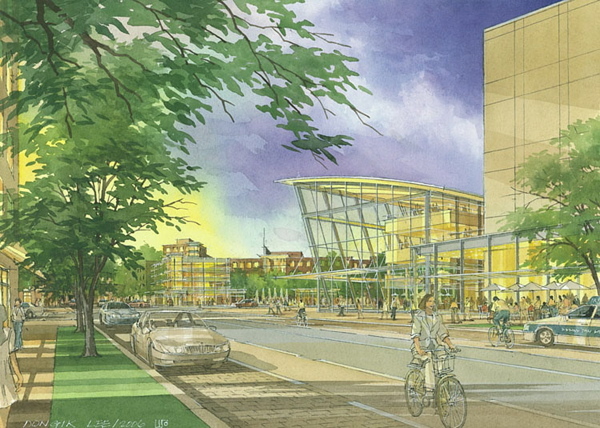 An artist's rendering of the completed campus shows, at center right, a triangular glass canopy to shelter patrons at the arts plaza, and the almost total reconfiguration of the athletic facilities. Before and after views centered on the Business School campus show how new development might appear. Shuttle buses could cross the Weeks footbridge once Soldiers Field Road is covered. 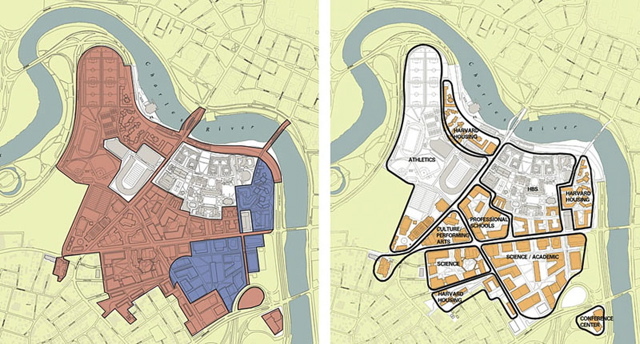 Phase one of Harvard's master plan (far left, in red) will last 20 years. Phase two (in blue) will be developed over a further 30-year span. Uses such as housing, professional schools, science, and culture will be clustered in districts. The open-space framework includes "greenways," landscaped paths linking distinct sections of the campus. A hallmark of the new campus will be mixed, interdisciplinary uses, including professional schools, museums, research facilities for science, and performance space. Barry's Corner, at the intersection of Western Avenue and North Harvard Street, is shown here as a combination of retail space, public plaza, and performance center. A new facility for the Harvard University Art Museums will also be located near this intersection, now dominated by gas stations. A variety of groups meet at Barry's Corner (the intersection of North Harvard Street and Western Avenue), linked by transit. 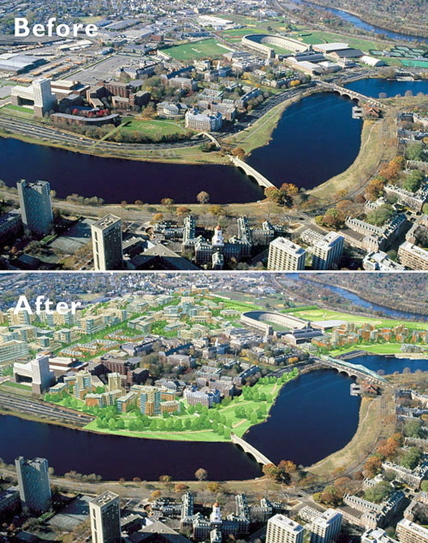 A digital rendering of the campus as planners envision it 50 years from now is superimposed on an aerial photograph of Allston today. Prominent among Harvard's proposals is the decking over of Soldiers Field Road on both sides of the Larz Anderson Bridge in order to improve connections across the Charles River. Ten million square feet of new buildings, as many as 12,000 new jobs, and many billions of dollars: the numbers alone suggest the scope of Harvard’s plans over the next 50 years for a new urban campus in Allston. To put things in context, realization of the plans would increase the University’s physical plant by more than 40 percent, and its total workforce of faculty and staff by nearly 80 percent. Harvard embarked on the mandatory yearlong public review of this multi-decade campus-building project on January 11, when it filed an Institutional Master Plan (IMP) notification with the Boston Redevelopment Authority (BRA). 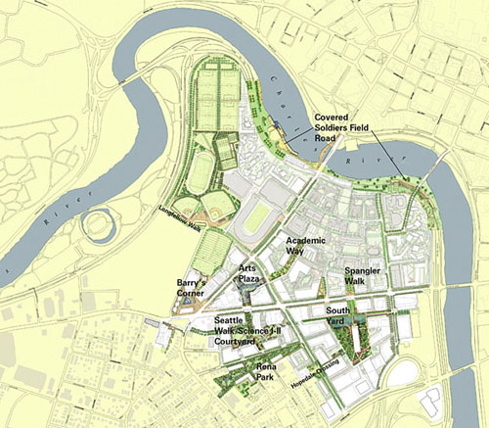 Highlights of the proposed campus include the decking over of Soldiers Field Road on both sides of the Larz Anderson Bridge, the reclamation of 30 acres of open space from existing industrial land, and the creation of two new river crossings: a pedestrian way parallel to the Larz Anderson Bridge that would cede the existing sidewalk to bicycle traffic, and a widening of Weeks Bridge to allow passage of public-transit shuttles serving the area. Within the campus, entirely new streets are proposed, in addition to an initial 5,550 underground parking spaces. All of the proposals will require approval from the City of Boston, and many will require the participation of state agencies if they are to be realized. 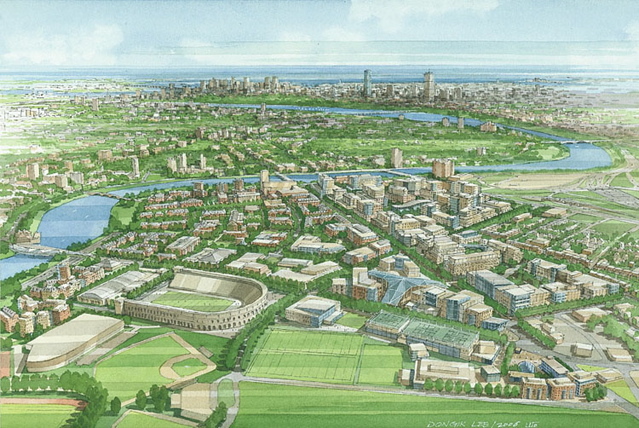 The principal elements of the plan have been outlined before: move the schools of education and public health to Allston; possibly build graduate and undergraduate housing; move elements of the art, anthropology, and natural history museums to an area that will also feature a performing-arts center; and, especially, build millions of square feet of space for scientific research. New information in the IMP includes the phasing of these elements, the specific locations for each, and details such as the nearly total replacement of athletic facilities. Part of that project would involve renovation and relocation of Dillon Field House to the area next to North Harvard Street now occupied by Blodgett Pool; it would serve as a student center welcoming people across the Larz Anderson Bridge at the halfway point on the walk between the Cambridge and Allston campuses, and would adjoin new undergraduate residential houses that would replace the existing riverside sports buildings and fields. There might even be wind turbines at the northern end of the current athletic fields as part of a bid to build a sustainable campus. Uses and locations specified by the plan could be changed, but doing so would require an additional public review. Because five- or 10-year plans were not filed, it is less clear exactly what the University seeks to build soon, and in what order (except for two specific projects on a fast track: a large science complex and new art museum). “Current zoning doesn’t allow for institutional development” in Allston, noted Kathy Spiegelman, director of the Allston Initiative and chief university planner. The IMP is the means for changing the zoning, and has to include site coverage (density), as well as building heights and configurations. Later, “when you get specific about projects,” she said, that triggers a public review. Among the transportation aspects of the plan are landscaped pedestrian paths throughout. The central green corridor, an element of interdisciplinary connection, is called Academic Way. 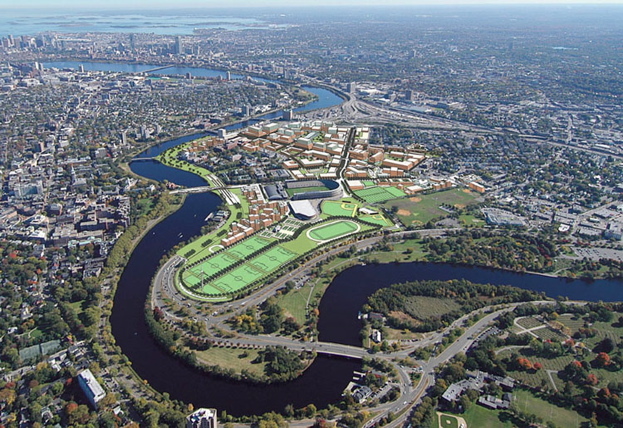 It runs from the southern edge of the current Business School campus on the banks of the Charles River, past the major features envisioned in phase 1: the proposed sites of the School of Education (300,000 square feet) and the School of Public Health (575,000 square feet), through the cultural center (including 75,000 square feet for performing arts and 240,000 square feet for museums), and down into the phase 1 science campus (1,500,000 square feet). As envisioned in the plan, a major reconfiguration of current athletic facilities will be necessary to make everything fit. Only the Stadium, the Murr Center, and the Gordon Indoor Track and Tennis Center won’t be changed. Blodgett Pool, Briggs Cage, and the Palmer Dixon tennis courts will come down if undergraduate housing is built as part of phase 1. Either way, “the number of undergraduates will remain the same,” University provost Steven E. Hyman told reporters at a news conference on January 11. A second location for undergraduate housing east of the Business School could be tapped if Harvard seeks to expand the College during the 50-year period—if, for example, the University wished to accommodate more international students without reducing the number of Americans. With graduate-student enrollment in engineering and applied sciences expected to rise only by about 140 during the next decade, “We do not expect a big increase in students,” summarized Hyman. Harvard planners said no building is expected to exceed the height of One Western Avenue, a three-year-old graduate-student housing complex that includes a 215-foot tower. The tallest building proposed in the first, 20-year, phase of the IMP is the initial four-building, 120-foot-high science complex being designed by architect Stephan Behnisch (see “An Allston Metamorphosis? ” November-December 2006, page 66). Construction could begin later this year. The density of the existing Harvard Business School campus in Allston is quite low, with a floor to area ratio (FAR, or ratio of a building’s floor area to the size of the plot on which it is built) of about 1. The FAR of Harvard’s Cambridge campus is about 1.5. The proposed campus in Allston would have an FAR of about 2, if one excludes the reconfigured athletic fields from the calculation. A major theme of the IMP is sustainability. Harvard hopes to achieve a mid-range LEED (Leadership in Energy and Environmental Design) rating for every new building. “No other institution in the country has decided to aspire to a gold rating for all its buildings,” McGregor said. Planners are also studying several different kinds of alternative energy sources, and have decided to stagger the construction of power-generating facilities in order to be able to take advantage of new and developing technologies as they become available. Meanwhile, vast areas of currently impervious, paved surfaces that cause polluted runoff to enter the Charles River will become permeable, allowing capture, and in some cases reuse, of rainwater on site. construction of a new road, Stadium Way, linking North Harvard Street and Western Avenue and extending southeast down to Cambridge Street. This will need to be built soon in order to connect the initial science complex to the rest of the proposed campus. Early comment focused on the level projections for student enrollment as compared to the size of the project. “How is it that Harvard is going to hire 4,000 to 5,000 more people… build more housing, and then…not have more students?” asked an incredulous Boston Globe reporter, referring to the plans for phase 1. “So you are essentially taking on all of this additional cost and serving the same number of people?” Hyman responded that the project is “not dependent on more tuition revenues.” A combination of philanthropy and Harvard money—presumably including new debt and user fees (board or rent from students housed in Allston, fees for parking)—is expected to cover the costs of the expansion. Given the emphasis on functions not related to educating students, there was also discussion about a project so vast that it seems likely to shift the very character of the institution toward a research-dominated agenda. Community reaction to the IMP has ranged widely. Members of the Harvard Allston Task Force, a group of local community leaders, have already raised specific concerns about deviations from planning guidelines previously established by Harvard, local residents, and the city; among the issues they raised are the specifications for the initial science buildings, which exceed a height limit of 95 feet and seem to preclude a conventional street grid. At a community meeting, residents also raised concerns that the configuration of those buildings around green spaces serves to shut the community out, rather than to create the permeable campus-neighborhood boundaries envisioned in the joint planning process. Task Force member Henry Mattison said that the open spaces depicted look like those at the Business School: “Open space for someone else.” Lacking are places to play Frisbee, ride a bicycle, or have a picnic. Residents also focused on the relatively limited retail space planned for the key intersection of Western Avenue and North Harvard Street.